Mumbai: India off-spinner Ravichandran Ashwin on Friday said that he should not be made a villain for bowling one of the two no-balls which proved to be a crucial factor in India's World Twenty20 semifinal loss to the West Indies. Ashwin's was one of the no balls which gave Man of the Match Lendl Simmons a reprieve and helped him anchor West Indies' successful chase of a stiff target of 193 at the Wankhede Stadium in Mumbai. "The day I went back home my dog had heat stroke. He had fits. It just showed me what is more important and what is very very important in life. I did not turn up a piece of paper for next three days. I haven't read about what people had said," Ashwin said ahead of his new franchise Rising Pune Supergiants' opening IPL game against title-holders Mumbai Indians on Saturday. "There have been good enough journalists and knowledgeable people who said I had not bowled a no-ball for ages and to have bowled one no ball, I don't become a villain. If that's the perception I don't know how to counter that," the bowler said at a media conference. Ashwin was widely castigated in the media for bowling a no-ball - being a spinner - off which he had Simmons caught at point, only for the batsman to escape on 15 and play a match-winning innings that knocked India out of the World T20 nine days ago. Ashwin took umbrage when a scribe asked him how he felt bowling with the wet ball because of dew, as the West Indies inched closer to India's total. "When there was dew I did not bowl. It's better you ask someone who actually bowled, to be very honest. I don't know how it felt with the dew on. It's very amusing because with the first 12 balls I bowled, I created a wicket opportunity as well," he retorted. Asked further that it was captain Mahendra Singh Dhoni who had said at the post match media conference that the dew had affected his team's bowling attack, Ashwin answered, "I don't know what the captain said." At the end of the conference, Ashwin confronted the journalist who asked him about the dew factor to find out the publication he represented. "I am not blaming you. But you should be responsible about what you write as millions of people read it and form an opinion," said the player to the non-plussed correspondent. 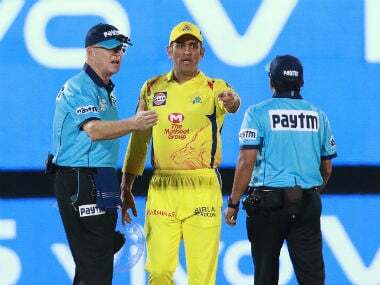 Dhoni had blamed dew and the two no-balls bowled by Ashwin and then Hardik Pandya, who too had Simmons caught off a foot infringement after the batsman had reached 50, squarely for his bowlers' poor display in his post match media presser. "You have to realise it was half an hour early start. A bad toss to lose. So, when they started batting the first few overs were fine, but after that there was a considerable amount of dew which meant the spinners couldn't bowl how they would have liked to," Dhoni had said. "It was coming on nicely and the ball was getting wet, so that was the difference between the first innings and second innings. The surface had some assistance for the spinners, it was gripping (when India batted), but in the second innings there wasn't much in it for them. It was quite difficult to score 190 (batting first)," were Dhoni's words. Looking forward to playing for a new franchise under Dhoni who had captained him and the suspended Chennai Super Kings for eight years, Ashwin said he had been waiting for the new challenge. "It's a fresh start, it's a new team for me and it's going to be a new challenge which I had always been looking forward to. It's very important to get into the new environment, see how much you can get better and add value to the team. It's very exciting and I am looking forward to it." Conceding that it was a bit difficult for the Indian squad's players to plunge into the IPL following back-to-back campaigns in the Asia Cup and World T20, Ashwin said the difference was that the T20 league was very fast-paced. "It's going to be difficult, no hiding it. It's going to be taxing - mentally and physically. The thing with IPL is it's very fast paced. "If you get in and if you try and beat your own odds and try to look for improvements during this time, it's going to help you as a cricketer and hold you in good stead throughout the year," said the off-spinner. According to Ashwin, T20 cricket has changed a lot over the last year or two with batsmen becoming more aggressive right through the inings and it was important for teams like India to be abreast of where it was heading. "In general I think T20 cricket has gone a notch up over the last year or two. The game has definitely evolved and it's very important to keep an eye on how much it has evolved." He also mentioned the last over six-hitting heroics of West Indian Carlos Brathwaite that knocked out England's hopes in the WT20 final at Kolkata. "When you saw the last over in the (WT20) final, Carlos Brathwaite (of West Indies) just came in and smashed it (ball for four consecutive sixes). It's getting into a zone, into a power game. People are not holding back and are going through from the first over to the 20th over. "May be the par scores will shift suddenly and by the time we realise, it could be a couple of years. The team that realises that and keeps going and catches the new breed of cricket that's being played around the world, it's going to help it (get benefited)." "It also helps that there are other leagues - Caribbean Premier League (West Indies), the Big Bash (in Australia), all these things are contributing to the scale of T20 cricket," he added. According to Ashwin, grounds in India don't have as much cross-breeze blowing across them which help in even mis-hits by batsmen going over the rope. "We played a big T20 season in Australia and then (Asia Cup) in Dhaka. I generally get the feeling that Indian wickets are probably the best (for batsmen) and the grounds are such that (even) mistimed shots also get out of the ground. "From a spinner's perspective, (even) mishits are going a longer distance and there is not enough cross breeze, especially in grounds like Bombay (Mumbai's Wankhede Stadium) and Bangalore (Bengaluru's Chinnaswamy Stadium). These are the challenges players will face in this IPL, but I am sure cricket will evolve and people will find new ways (to counter the challenges). Ashwin, who caught the national attention through the cash-rich league and became a successful Test bowler especially in Indian conditions, praised the scandal-hit IPL for its various plus points. "IPL has thrown a lot of cricketers into the mix. I would say it's a very important competition. As far as Indian cricketers are concerned it helps you rub shoulders (with the top cricketers from India and overseas), takes away the pressure at big moments. It gives you a feeler about what international cricket could be all about. That's a great stepping stone between first class and international cricket." "IPL is one place where you can improve more and more and can look at other avenues to improve as you have lots of down time and (there are) good practice facilities because you play at international grounds. And also it's one of the best T20 leagues around the world." "I am looking forward to (playing for Pune). I wanted to come and play for a new team. This franchise is new, they have to adjust to the logistics, understand the team dynamics. You may lose a few games; that's the nature of this tournament. "You have to live with losing some close games and not try and press forward. Players and franchise working together is going to be a big challenge and the best for me in this IPL. "In the first-ever IPL (in 2008) I stood at a different place and where I stand now is different. I know there is a fair amount of expectation on me. It's important I live up to it and contribute to the whole cause of the team." Ashwin said his team had a lot of experienced players which will ease captain Dhoni's burden considerably. "Even in a T20 game the captain's job is very limited, boiling down to rotation of bowlers and making those subtle changes. When you have an experienced team like we have, it makes the captain's job that much easier." He also said former England batsman Kevin Pietersen would do well in the league with his style of aggression. "KP is hitting the ball really well. He has been one of the finest batsmen I have seen to have toured India, from a foreign batsman's perspective. He has come and done really well even in Test games and all that. He is a great striker of the ball. I am looking forward to see him bat."